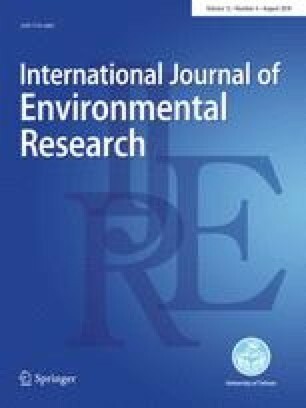 Heavy metal (Cr, Cu, Zn, As, Cd, and Pb) concentrations in irrigation water, soil, and vegetables were measured to assess the contamination levels in a multi-industry district in Bangladesh. In this district, wastewater discharged from three industrial areas (textile, dye, agrochemical, paint and ceramics factories) was mixed with irrigation water. The Zn, Cu, Pb, and Cr concentrations were high in both irrigation water and soil, and all of these concentrations exceeded the permissible limits except for the Cd and Pb concentrations in irrigation water. Hierarchical cluster analysis of the irrigation water and soil data revealed that the contamination of irrigation water and soil was caused by the discharge of industrial waste into the irrigation water. The heavy metal concentrations in leafy vegetables were mostly below the FAO permissible limits, whereas the As, Cr, and Pb concentrations in root vegetables exceeded the permissible limits. Correlation and cluster analyses of the vegetable data showed that the use of contaminated irrigation water and soil might be responsible for the heavy metal contamination in vegetables. According to the bioconcentration factor (BCF) in root vegetables, the transfer from soil to vegetables of As, Cr, Zn, and Pb was moderate/low, whereas that of Cd and Cu was high. Since these root vegetables were deemed unsafe for human consumption, this type of contamination should be considered more seriously when planting root vegetables. The authors want to express their sincere appreciation to the related authorities of Kyushu University, Japan and Bangabandhu Sheikh Mujibur Rahman Agricultural University (BSMRAU), Bangladesh for providing the laboratory facilities during our research work. The authors also wish their gratitude to Dr. Akinori Ozaki, Assistant Professor of Institute of Tropical Agriculture, Kyushu University for his support of sample import from Bangladesh to Japan with permission, and for his guidance in analyzing the samples by using ICP-MS instrument.